Comforting and extra delicious! 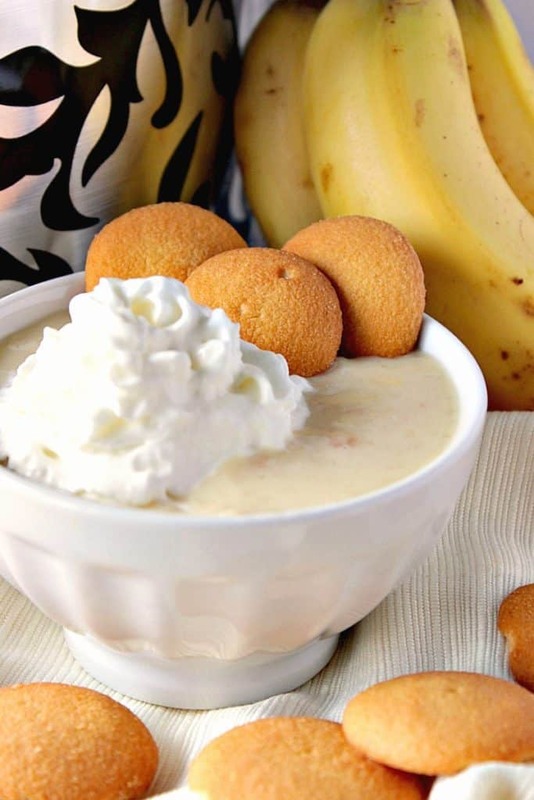 This super easy and creamy slow cooker banana coconut pudding will be your new favorite dessert! Be ready for one of the easiest and best-tasting banana puddings you’ve ever tasted! Slow cooker banana coconut pudding is comfort food for the soul, and it’s a dessert you’ll want to add to your list of recipes to make, ASAP! 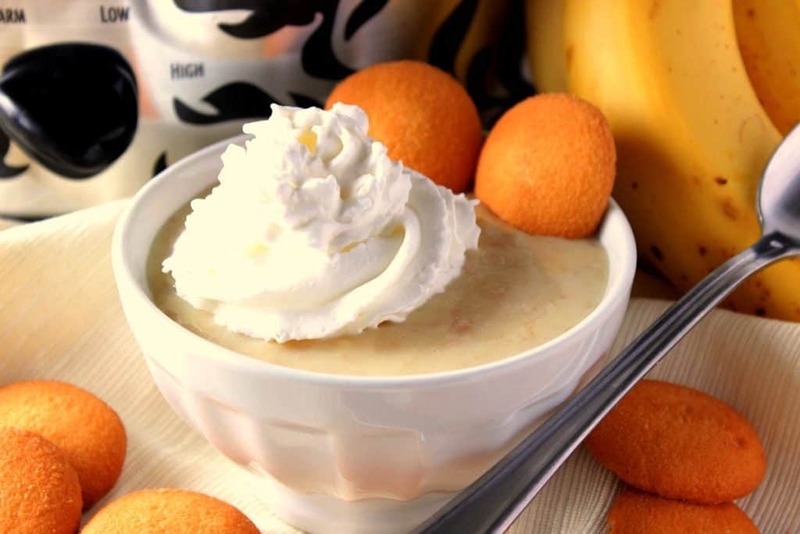 **Please Note – The printable recipe card with detailed instructions, complete ingredient measurements, and nutritional information for making Slow Cooker Banana Coconut Pudding is available at the end of this post. I don’t make a lot of slow cooker desserts because I usually reserve my slow cooker for savory dishes. However, the few I have made are really good. I hope you’ll check them out if you’re looking to step out of the slow cooker rut as I did. Sweet endings that are made in the slow cooker. Not your grandma's applesauce. This one is kicked up a notch with pears, nutmeg and amaretto. It's a blackberry fruit strata for the slow cooker with cream cheese and maple syrup. Chock full of walnuts, plump blueberries and pumpkin. This delicious slow cooker cake is wonderfully flavored and textured! Because, why wouldn’t you make a Slow Cooker Caramel Cake? It’s kind of a no-brainer, if you ask me. 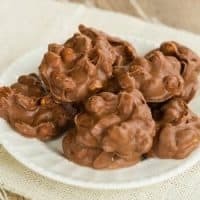 Melted dhocolate, peanuts, and a super easy recipe. What more could you want to a slow cooker dessert recipe. I know there are also slow cooker desserts in the round-up at the end of this post from the #SundaySupper group, so make sure you click on those titles and get those recipes as well. What makes this slow cooker pudding recipe work? 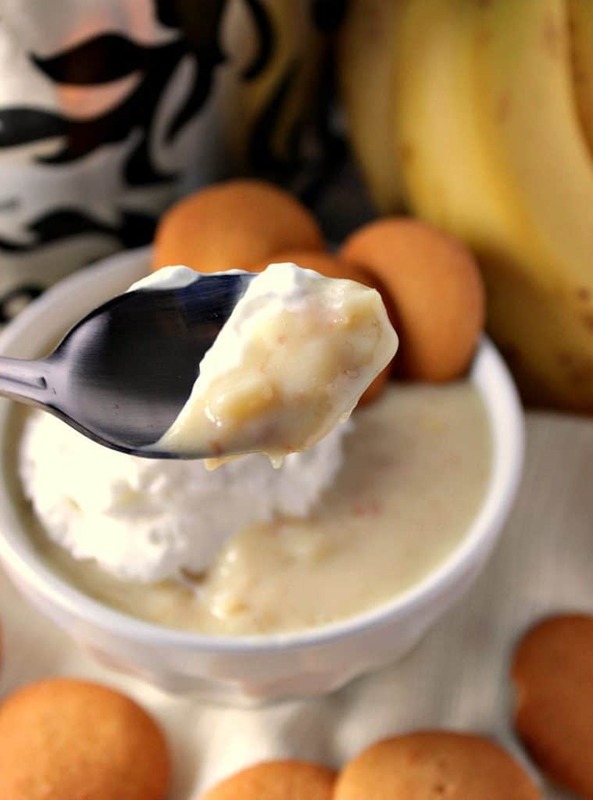 This slow cooker banana coconut pudding is basically a dump and stir recipe, as most slow cooker recipes are (in my opinion). That’s what makes them so apPEELing (sorry, banana humor), and non-threatening. Honestly, the only thing you really need to do to make this pudding a standout is to toast the coconut in a dry skillet to bring out its coconutty flavor before adding it into the cooker with all the other ingredients. Adding the pinch of salt is also important. It may seem like a tiny amount (and it is), but even a tiny amount of salt can help bring out the flavor and sweetness in any kind of dessert. Salt is always a key ingredient in both sweet and savory dishes. Please do not omit it. Place the overripe bananas in a small (4 quart) slow cooker and mash them well. Pour in two cans of the sweetened condensed milk. Add the toasted coconut, pure vanilla extract, and the salt. Add the lid to the cooker and set to low. Cook for 4 hours. After four hours time, add two tablespoons butter and 1 egg yolk that has been mixed with 2 tablespoons of the hot pudding mixture. Stir the egg yolk and pudding to temper the egg. Stir the tempered egg in the with pudding mixture. Cover and continue to cook for an additional hour. Cool the pudding and refrigerate. The pudding will thicken as it cools. 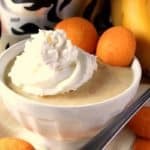 Spoon the pudding into bowls and garnish with whipped cream and vanilla cookies if desired. 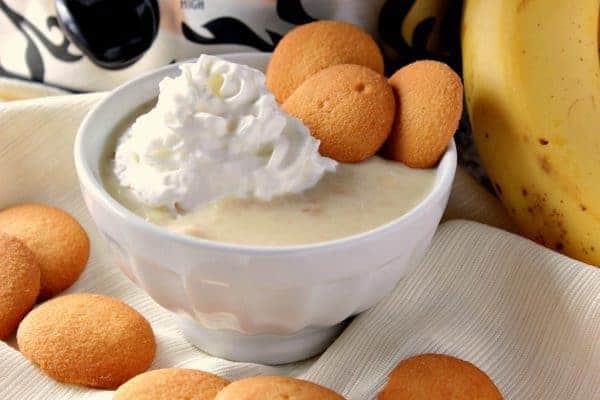 **The following affiliate links are some suggested slow cookers I’ve chosen that will aid you in the making of this recipe for Slow Cooker Banana Coconut Pudding if desired. Toasting coconut is easy to do on the stovetop. Add the flaked coconut to a dry skillet and cook, stirring frequently, over medium/low heat. The coconut will brown quickly so don’t walk away from the stovetop while toasting coconut, or you’ll go from toasted to burnt in the blink of an eye. 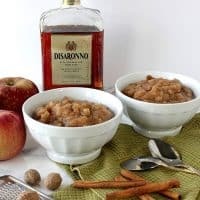 Can I use a slow cooker that is larger than 4-Quarts to make this recipe? If you don’t have a small slow cooker (4 quarts), you can definitely use a larger slow cooker but you’ll need to cut down your cooking time by half, which isn’t necessarily a bad thing OR double the recipe and make more pudding! 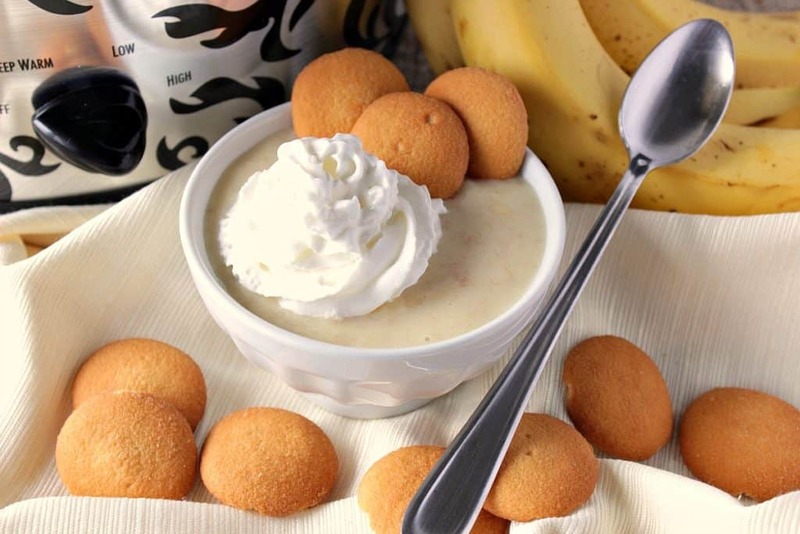 Below is the printable recipe card for today’s Banana Coconut Pudding for the Slow Cooker. Add the overripe bananas to a small (4 quart) slow cooker and mash well with a potato masher. Stir in the sweetened condensed milk, vanilla, and salt. Cover and cook for 4 hours on low. Remove the cover, add the butter and egg yolk that has been mixed with 2 tablespoons of the warm pudding (to temper the egg). Stir well to combine, replace the lid and continue to look for an additional hour. Cool the pudding and then refrigerate until ready to serve. *Note - the pudding will thicken once chilled. Serve with whipped cream and vanilla cookies if desired. I sincerely hope you’ve enjoyed today’s recipe for Slow Cooker Banana Coconut Pudding as much as I’ve enjoyed bringing it to you! I hope you’ve enjoyed my contribution this week for #SundaySupper Slow Cooker Comfort Food Recipes as much as I’ve enjoyed bringing it to you. Should you have any questions or comment for me regarding this recipe or any other items you’ll find here on my blog, please don’t hesitate to contact me directly or leave me a comment in the comment section at the end of this post. I promise to get back with you ASAP with the answer to your questions. Below you’ll find all the slow cooker comfort food recipe links from the rest of the #SundaySupper members who participated in this week’s theme. By clicking on the recipe titles, you’ll be taken directly to that blogger’s site and the recipe you’re interested in. **Note – The post above includes affiliate links. As always, I truly thank you for your support! I’ve never made a pudding in the slow cooker, but I bet it’s super creamy! Love the flavors in this banana coconut verison! Thank you for your wonderful blog. I look forward to reading it every day. What a great treat to make on a day off! I might try it without the coconut first though. 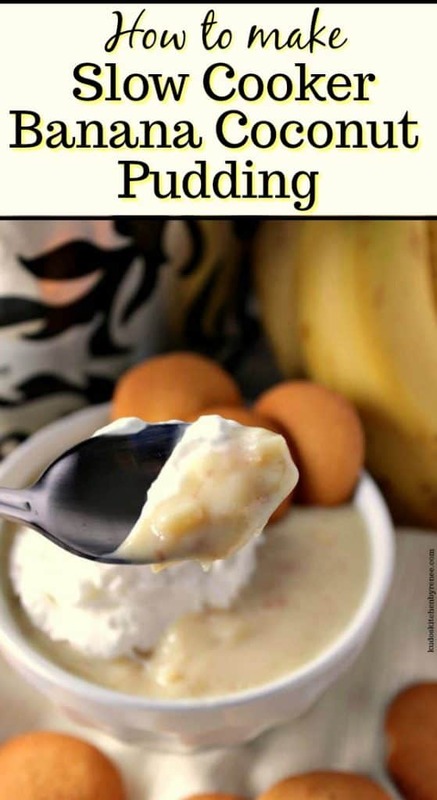 I want to pull out my slow cooker right now and make a huge batch of this pudding! I love a good banana pudding and hello slow cooker too! wow. This sounds like such a great pudding to make for the kiddos! Yum! The kiddos will love this. Adults too! 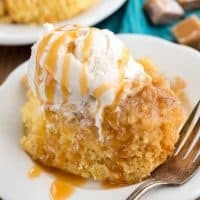 Slow cooker desserts are awesome, and I’m loving the flavors here! OMG. I’ve never made a slow cooker dessert before, and it’s high time I tried! My husband and daughter will LOVE this combination! Super creamy and easy to make! Yes to both of those things! You win dessert of the day! This looks amazing! This pudding seems to be so healthy and perfect for my breakfasts! Quite a handy recipe as when I don’t get to my bananas, I always peel them place in a ziplock and toss in the freezer. They are also wonderful buzzed up frozen in the food processor as ice cream, but one can only do that so many times before getting bored. Now pudding sounds like a great diversion! My slow cooker just jumped for joy! Such a fantastic recipe! Thank you! HaHaHa! That’s great. I know your slow cooker will love it! You had me at banana pudding! What a great idea to make it in the slow cooker! This recipe looks so easy and so yummy that I’ll have to make sure I have company when I make it or I just might eat the whole pot. Btw, I love the addition of the coconut into the mix too for that little tropical flair. I’m a cocoNUT by nature. I add it whenever I can. Glad you like the recipe. Thanks, Linda. I have to admit, I did sample quite a bit out of my slow cooker!! SO tasty!! My family loved it, too.